Managing Benefits has been carefully designed to complement existing Best Practice in portfolio, programme and project management such as PRINCE2 ®, MSP ®, P3O ® & MoP ®. It consolidates existing guidance on benefits management into one place, while expanding on the specific practices and techniques aimed at optimizing benefits realization. 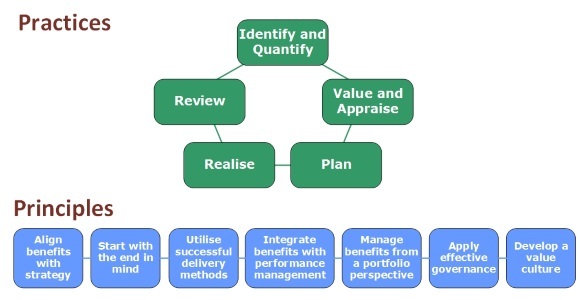 The following graphic illustrates the Benefits Management Model embedded in the Managing Benefits guidance. Inspiring Projects is an Accredited Training Organisation – so you can be confident that the courses we deliver conform to the highest standards of Managing Benefits training. All of our Managing Benefits courses are based on the latest version of the syllabus. The following diagram shows our Managing Benefits courses in relation to the goals supported by each course. Combines the Foundation course and Practitioner seminar. The Foundation course is your entry into Managing Benefits. The Practitioner seminar ensures that you can integrate and apply Managing Benefits concepts. A workshop on integrating Managing Benefits guidance into existing project and programme management methods. These courses are delivered in-house for groups. Please contact us for more information. The APMG-International Managing Benefits and Swirl Device logo is a trademark of The APM Group Ltd.